There can be no doubt that all businesses in future will be internet based. Service providers and clients will be utilizing the power of internet to complete their transactions. In such a scenario, it is prudent to become associated with a company that does not require a brick and mortar office and relies completely on internet. eXp Realty is the best when it comes to providing compensation to its agents. There is a 80/20 split and a $16K cap which means you retain 80% of the commission from a deal. There is also a revenue sharing model where agents are given bonuses in the form of stocks of the company and cash. You become a co-owner rather than just working for a company. With other real estate companies, you face a problem when you stop working because of illness or other personal problems. You have to work till you drop as retirement is just not thinkable. 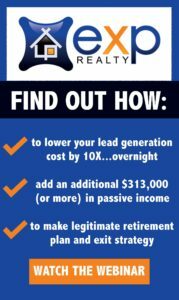 But with eXp Realty you get financial security as they have a residual income plan. By introducing new members and by sponsoring other agents, you can ensure that your income does not stop even if you stop working for eXp Realty. Join a company that makes sure you are successful with its powerful live training from its real estate experts. You build your business through full backing and support of eXp Realty. Agents are treated as members of a team and they are guided to success by the company. While you are only a worker as an associate of any other company, you become a co-owner of the company when you become associated with eXp Realty. Its revenue sharing model gives you a chance to own the stocks of the company. With no limitations imposed by brick and mortar offices, you are free to build a business using the power of internet. eXp Realty is the company to be a part of if you are tech savvy. It provides powerful technology tools to make sure you are successful as an associate. eXp Realty is different from other realty firms in the sense that associates are looked after well by brokers who are leaders. eXp Realty is the best when it comes in providing support in conducting real estate transaction and closing of deals.